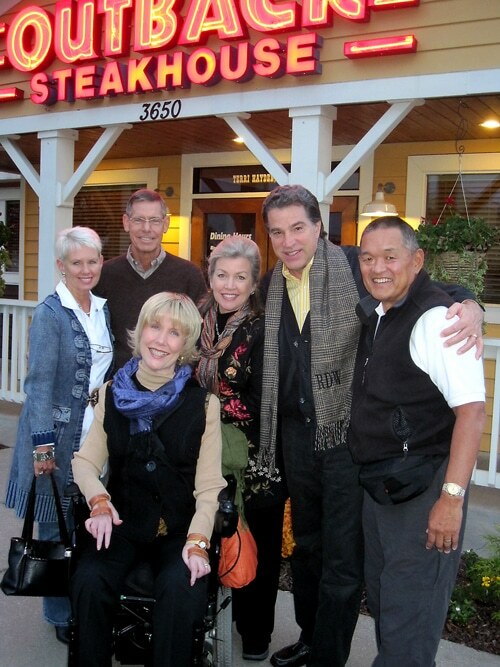 Getting together with Robert and Bobbie Wolgemuth always makes for beautiful harmony — for us, it’s just natural to break into a couple of hymns inside a hotel lobby or standing outside an Outback Steak House! And with our friends Bruce and Sue Osterink (far left), we had a virtual choir. Don’t you love it when the Spirit of Christ brings old and new friends together around a couple of hymns? Robert and Bobbie did the “What Wondrous Love Is This” Book/CD series years ago… and we haven’t stopped singing since :-). Today we head to Zondervan Publishing (and maybe they’ll consider re-releasing the Joni book to a new generation of younger readers?!). After our meeting, we head back to Chicago tonight, so bless you for praying for safety as we travel. We’re on the home stretch!